Mulching is a great way of aiding your plant’s growth by maintaining moisture in your garden, controlling the growth of weeds, protecting your soil, and stabilizing your soil temperature. Mulch is material that is spread over your soil’s surface to aid plant and soil health. Mulch is permeable, allowing air, water, and nutrients to pass through it and into your garden’s soil. Mulch also helps in preventing the spread of soil-born diseases. As mulch decomposes, it increases your soil’s fertility, furthering the development of your garden plants. When people apply mulch for weed control, they often make the mistake of applying the mulch too thickly. 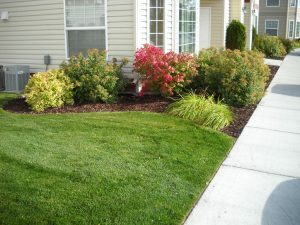 Our technicians know how to provide quality Idaho Falls mulching, using just enough to prevent the growth and spread of weeds, while still keeping it permeable enough for your plants to survive and thrive. New Leaf Landscape Design & Maintenance will apply mulch for moisture conservation in your soil. Idaho Falls mulching is often a good idea around fall, as this will help your plants to hold in the moisture they require, as well as preventing desiccation and tissue burn during the winter. In fact, mulching for winter protection is one of the most important reasons to mulch your garden. While it is true that your soil will freeze during the winter, mulching will help the temperature change to be more gradual, and reduces frost heaving which results from rapid temperature fluctuations. The best time to apply mulch for winter protection is during the late fall, when frost is just beginning to appear on the ground. The same principle applies for warm temperatures. Mulching during the spring will help make the change in temperature more gradual for your plants, which helps maintain their health and beauty. 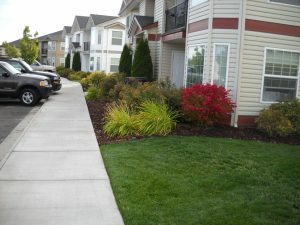 Idaho Falls mulching will improve the overall aesthetic appeal of your property. Mulched gardens look more visually consistent, adding a level of contrast to the rest of your lawn that really makes your garden stand out. Mulch is very easy to shape and spread, and can be made to make your garden’s surface level more uniform in both height and shape. Depending on the environment, mulch can last for over two years before needing to be replaced. However, the best times to apply mulch is every spring and summer, which may require removing old mulch and replacing it with fresh, nutrient-rich mulch. Idaho Falls mulching is one of the easiest and most affordable ways of improving the health and appearance of your garden. Our technicians know how to make all of the right measurements and lay mulch down on your garden with the right level of thickness and consistency. With New Leaf Landscape Design & Maintenance, your garden will look better, live longer, and maintain its health year round.